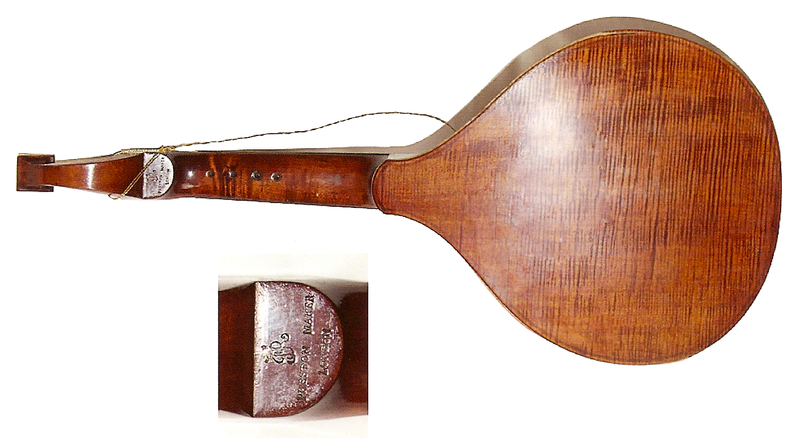 An English guittar made by James Preston of London, probably in the latter half of the 18th century, and owned by a woman in Kent who purchased it during WWII. She wished it to be fully restored and made playable. She provided these photos. 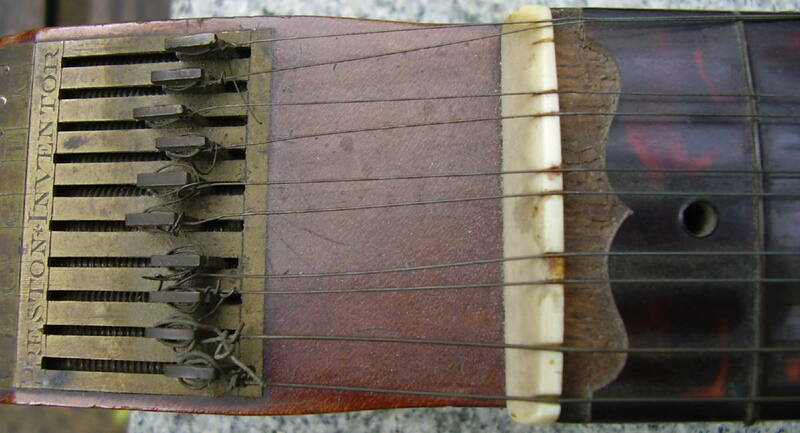 It arrived a bit dirty, with the back partially off and old strings on a non-original bridge. 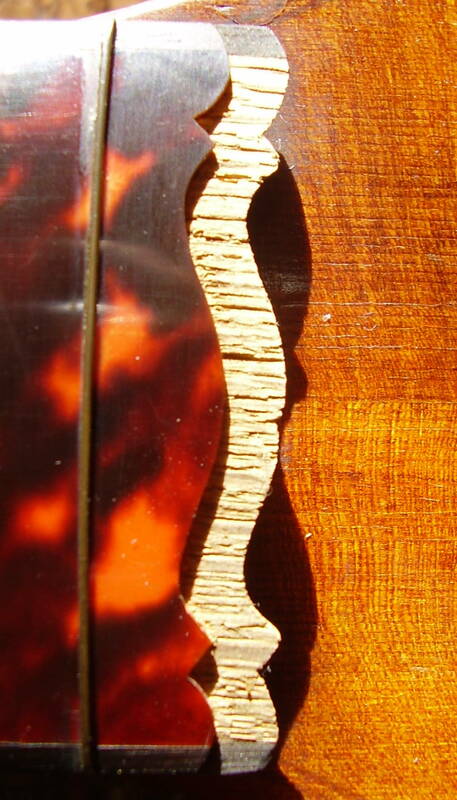 Some of the veneer on the fingerboard and the head was missing. 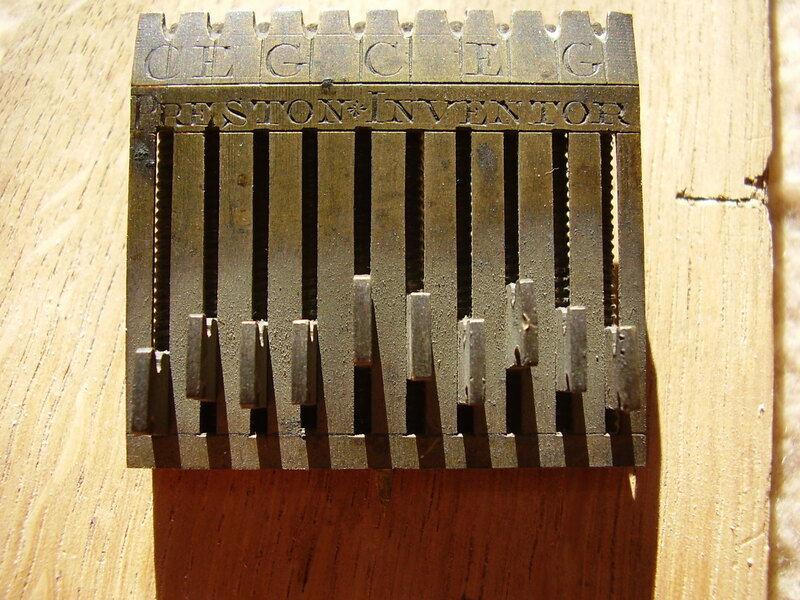 Preston used a hammered stamp to impress his initials and name on the back of the head. Two impressions were made and they don't quite coincide. 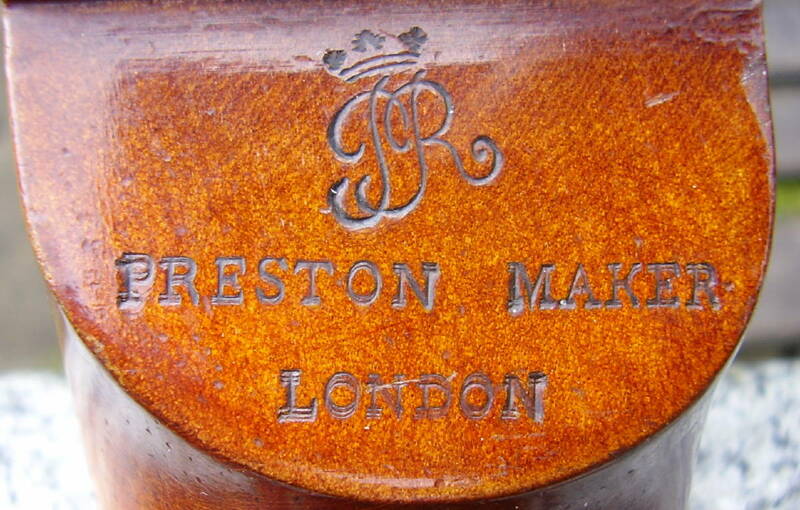 The engraving on the watch key tuning mechanism bears an inscription that claims Preston to be the inventor. 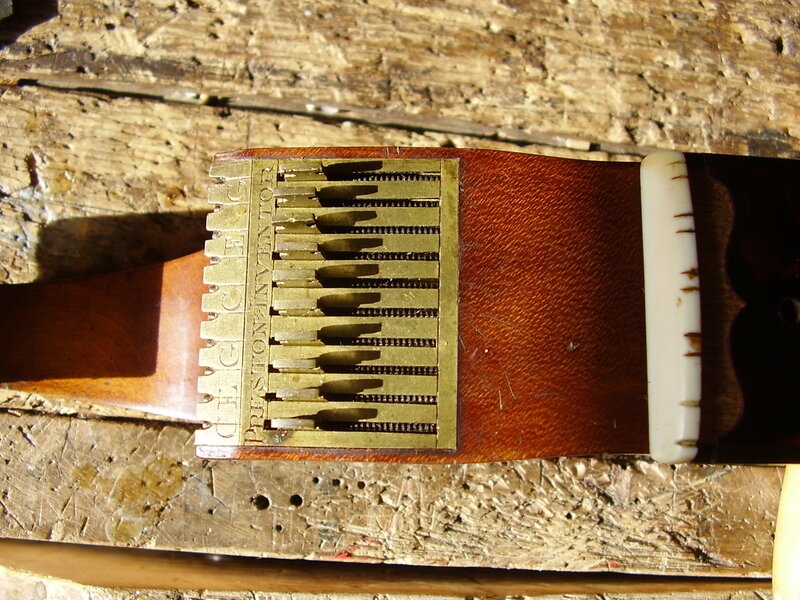 This may not be true as the Hoffman below has a similar mechanism and is dated 1758. 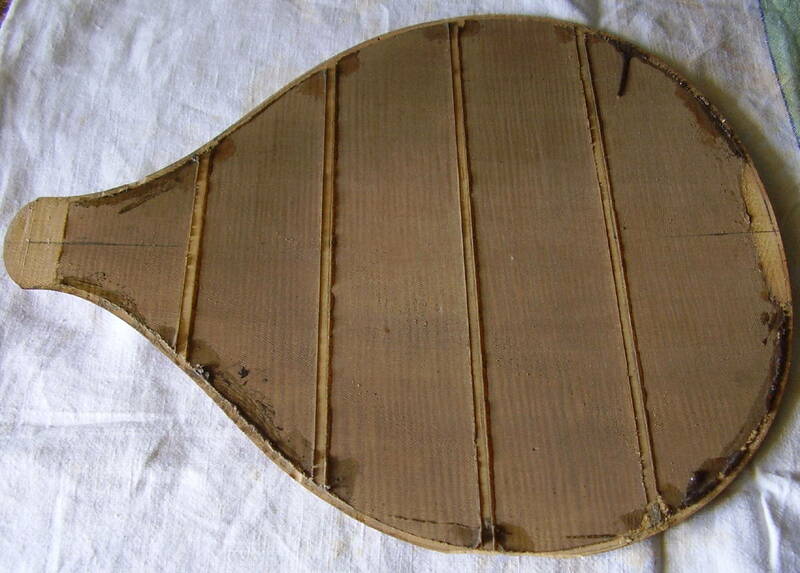 The back came off easily but none of the four bars remained glued to the back. 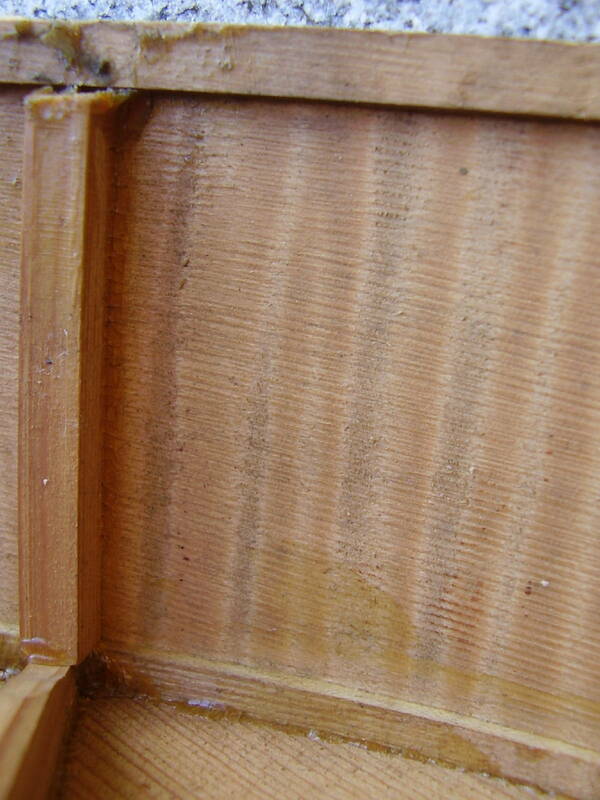 I could have removed all the old glue but feared the thin wood would warp with the heat and moisture. I left the old glue in place and it served to align the bars as they were glued back in place. 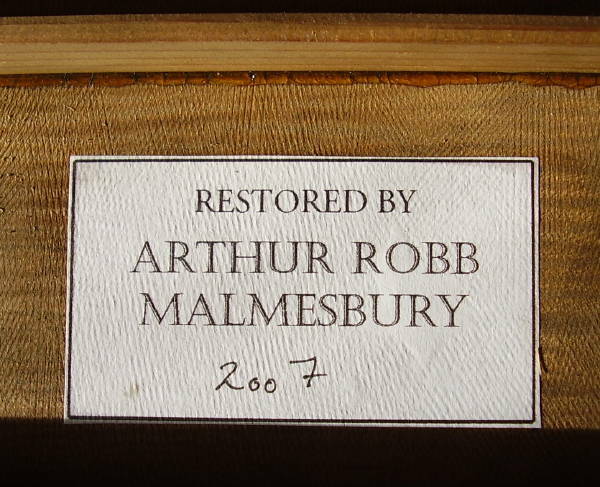 Enough work was being done here to justify a restoration label. On the inside the wood had been worked with a toothed plane while on the back the figure in the wood showed beautifully through the varnish. 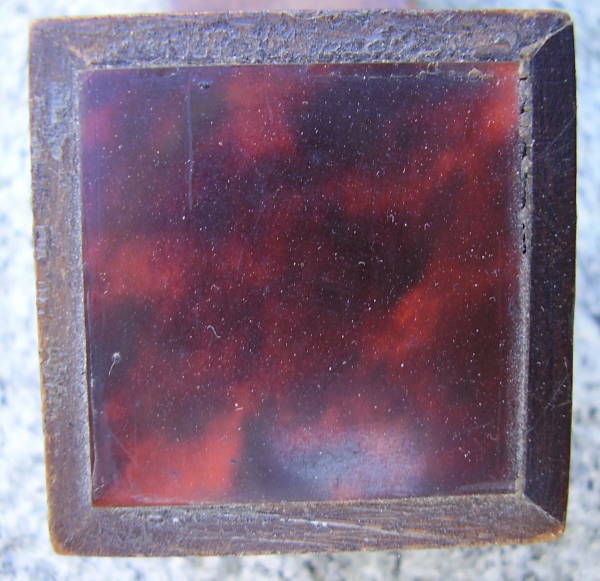 Without the back attached, the inside of the body could be examined. Many bars were loose, there was or had been a wood work infestation and the makers tool marks and craftsmanship were revealed. The neck block was pinned to the neck and the rear block showed a few splinters where the hole for the end pin had been drilled. 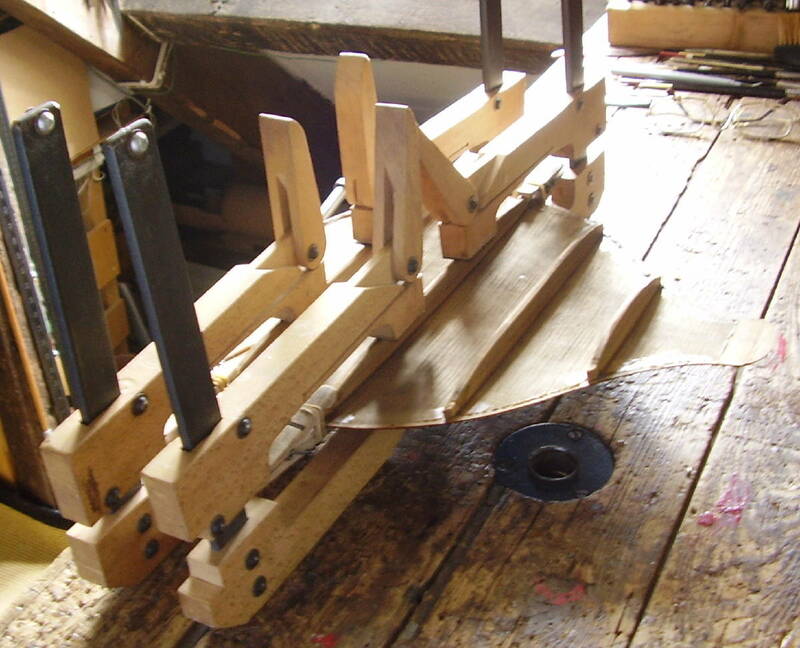 Mr. Preston used a toothed plane for the inside of the back and sides, but not for the bars or the top. From the back it is apparent that the rose has been stamped or pressed. 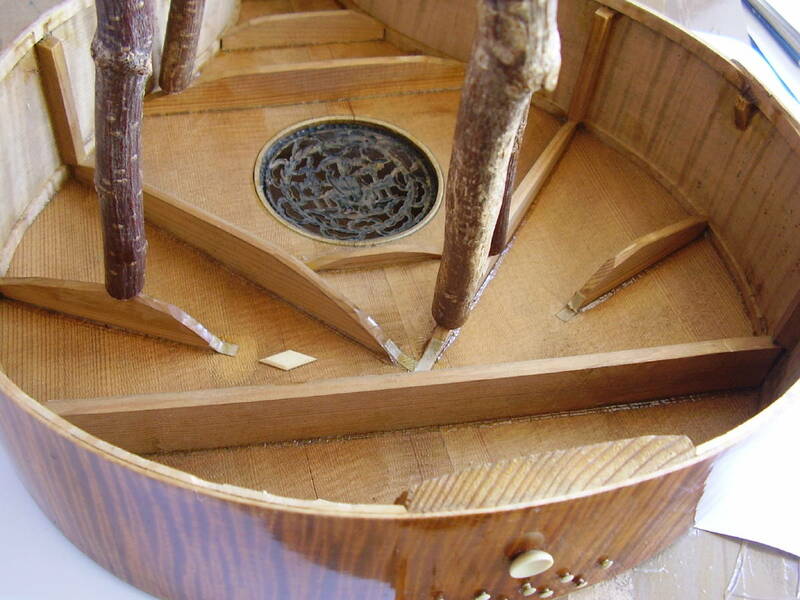 First the entire instrument was treated for woodworm. 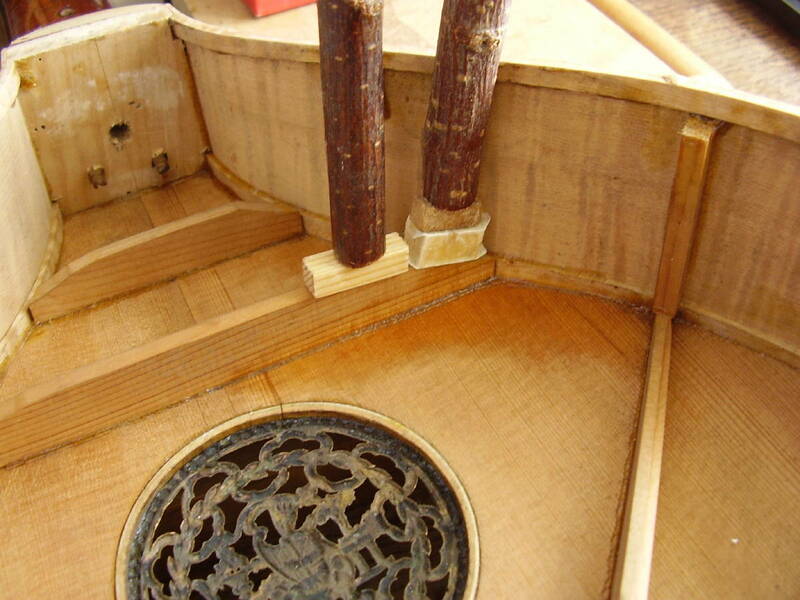 Glue was removed from the body/back joint area, then all the loose bars were re-attached. 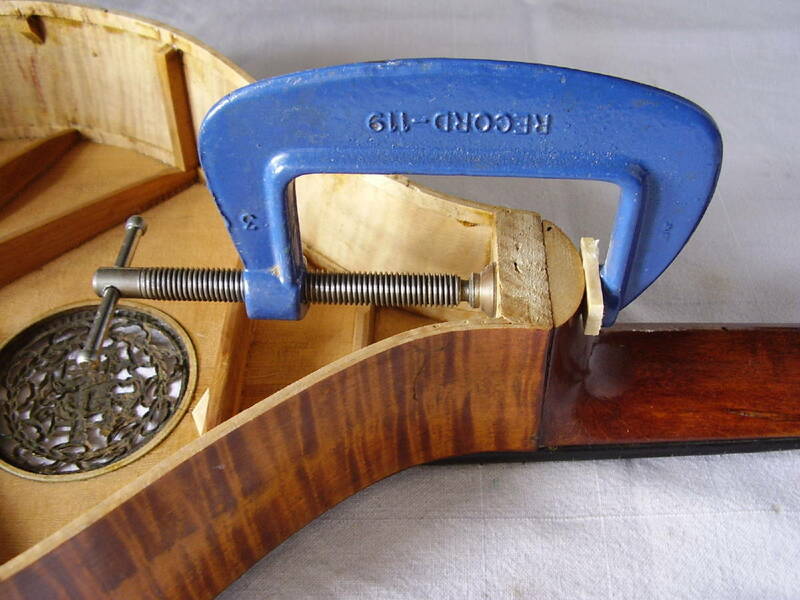 There were cracks in the soundboard and these were stablised with small spruce diamonds. 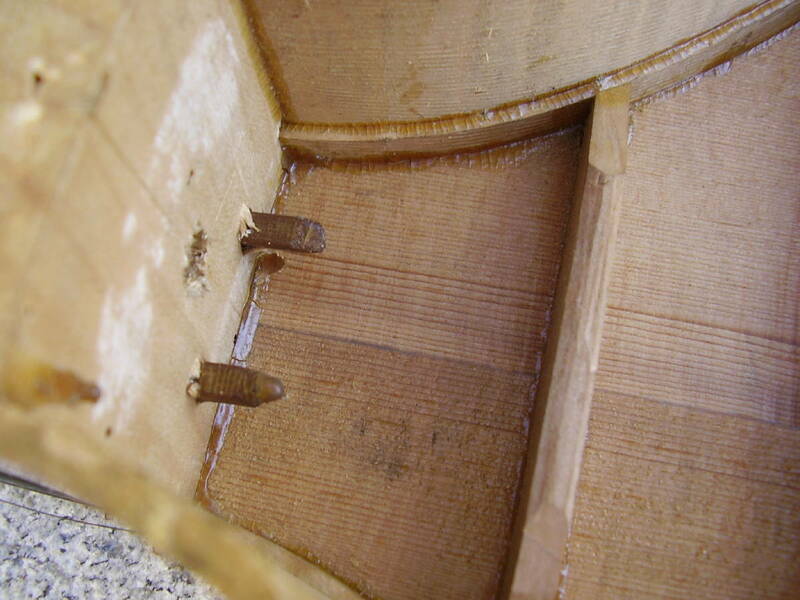 The neck to neck block joint was loose and glue was fed into the joint and clamped up. 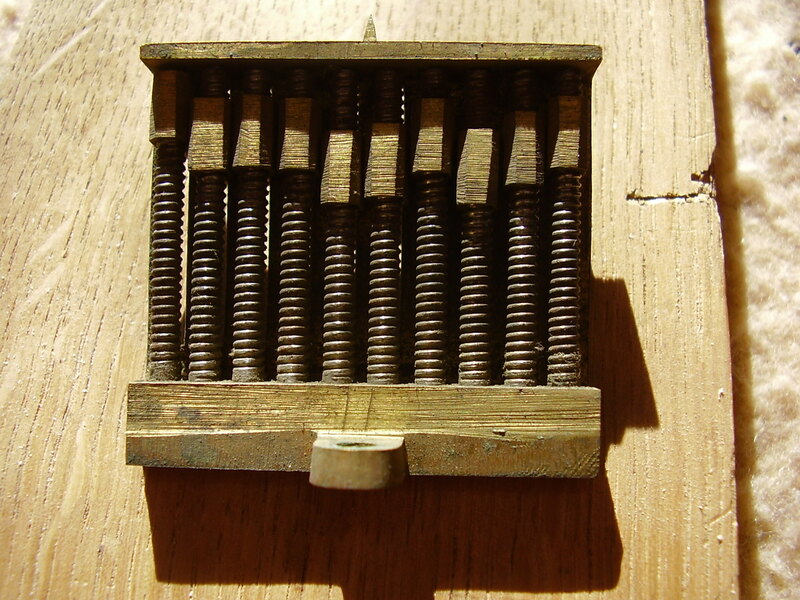 The watch key tuning mechanism was easily removed for lubrication and cleaning. Some restorers clean the brass so it looks like new, but I never feel that is appropriate. The mechanism fit back into it's slot perfectly. 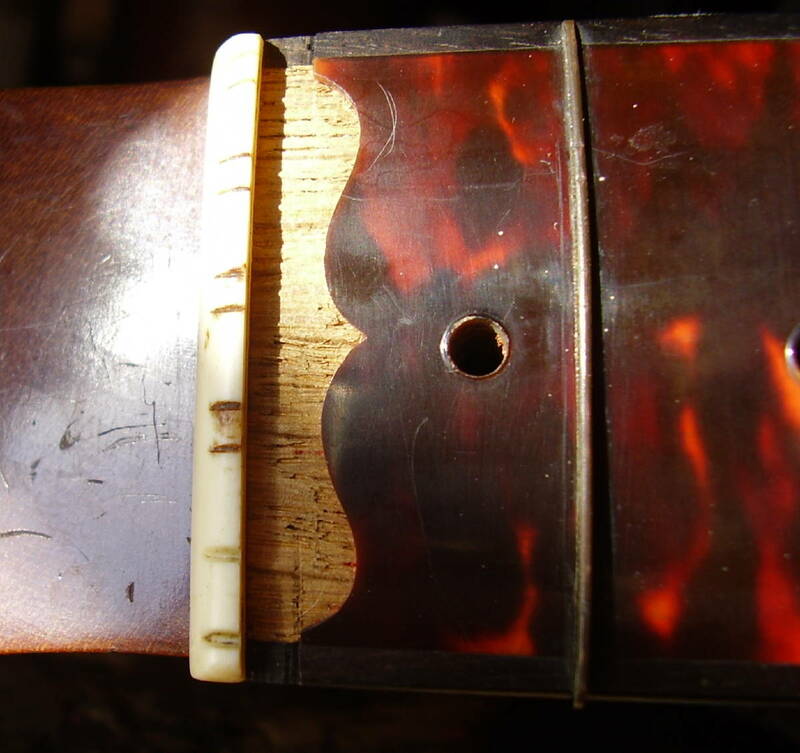 The neck with it's tortoise shell fingerboard and sheet brass frets needed attention. 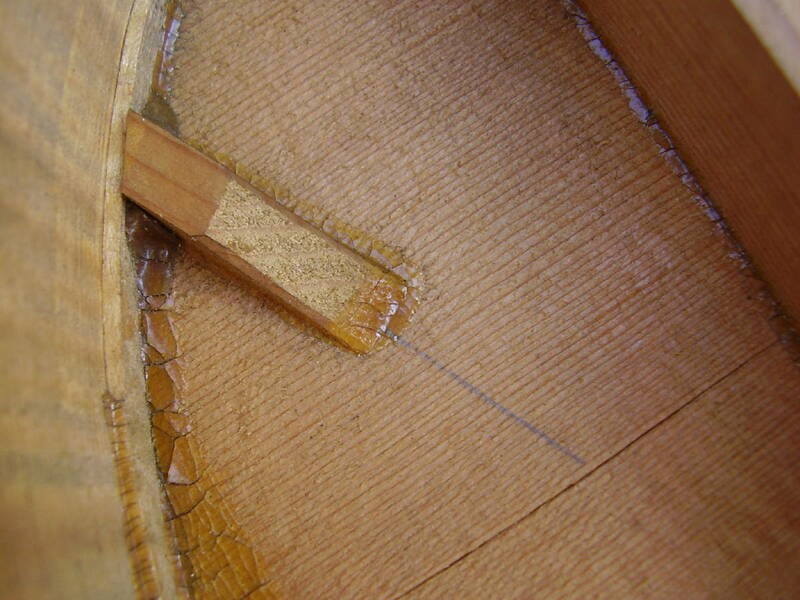 The frets were all reused, but dots of superglue were needed to keep a few in place. 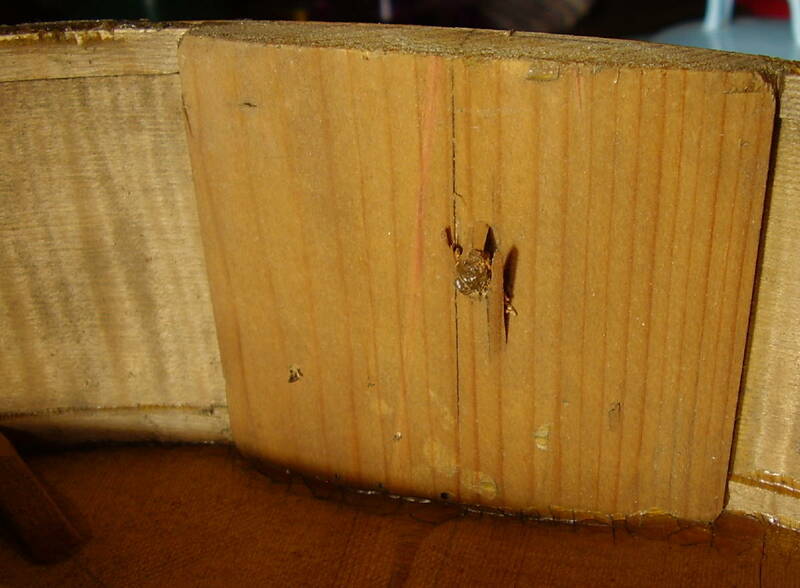 The fingerboard was missing a piece of veneer at either end. 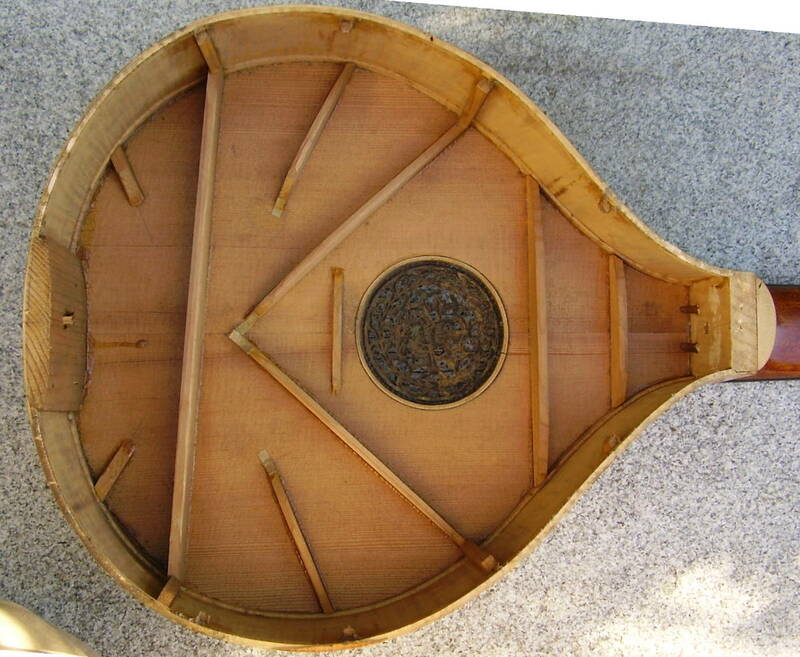 There was no hint on the instrument as to what the original material was. I looked some other Preston guittars and saw photos of many others. 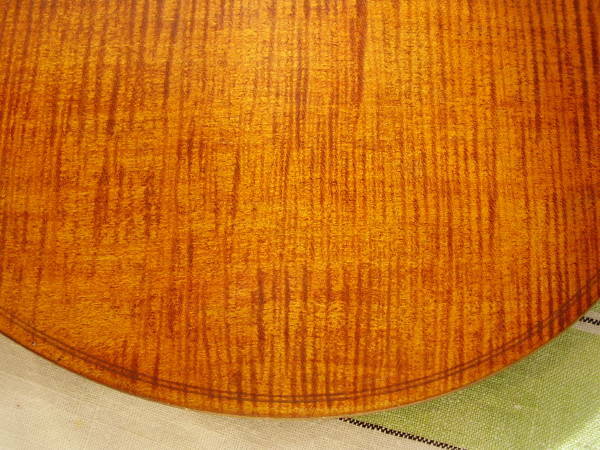 Mr. Preston seemed to use a wide variety of materials for inlay. I chose to fill the missing areas with ivory. 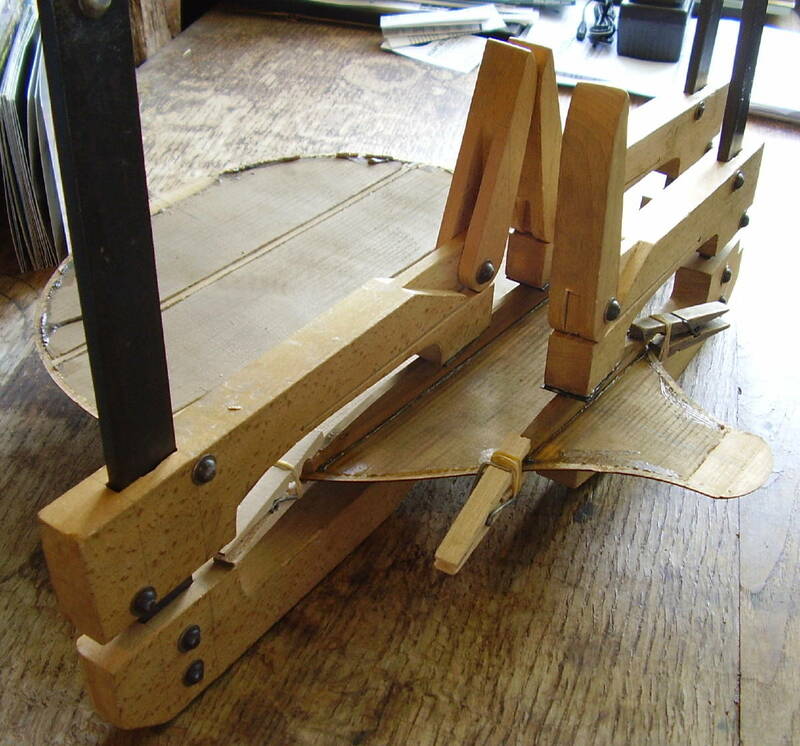 Using modern ivory was out of the question, but I obtained some very old ivory harpsichord keys and used those to manufacture the missing veneer shapes. 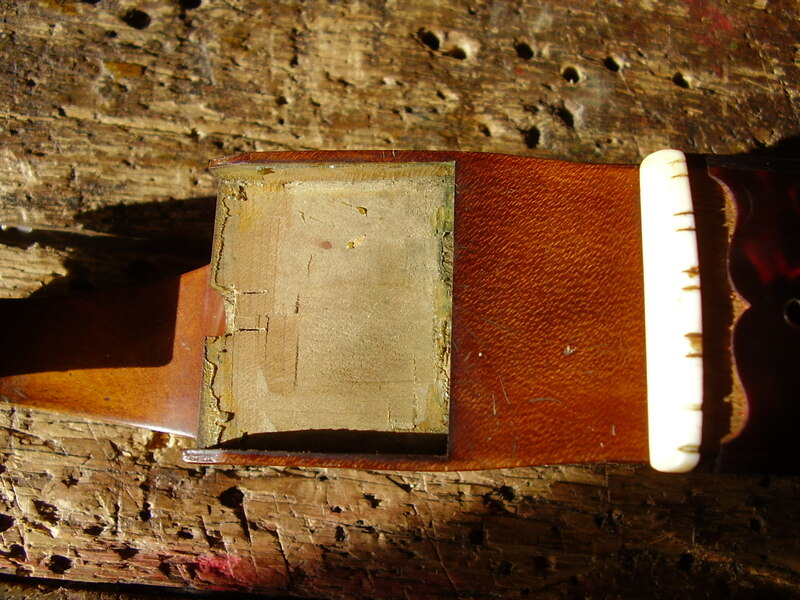 The tortoise shell cleaned up very nicely and the last step was to dress the brass frets. 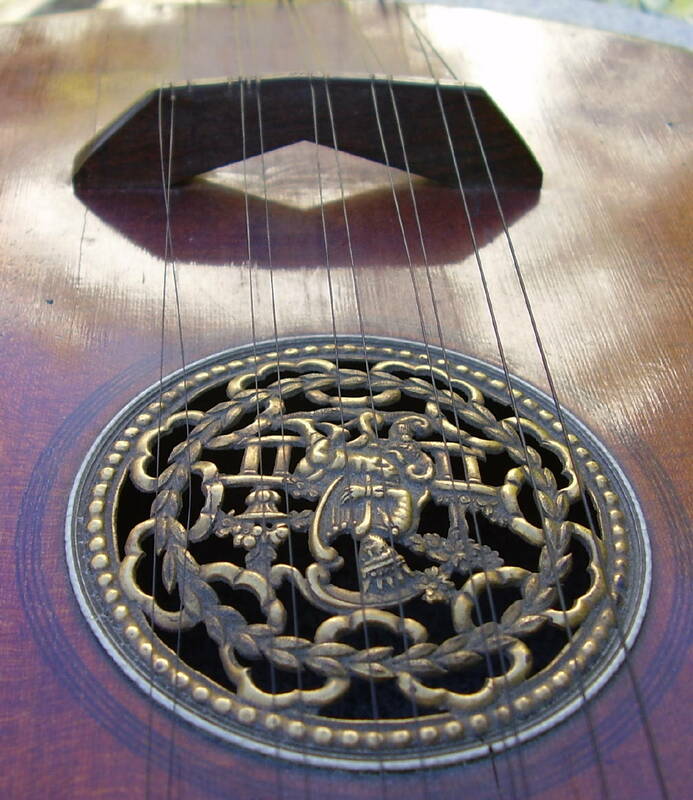 The stamped rose cleaned up well and is similar to the rose used in the 1788 Gibson below. Neither rose is aligned with the centre line of the instrument. 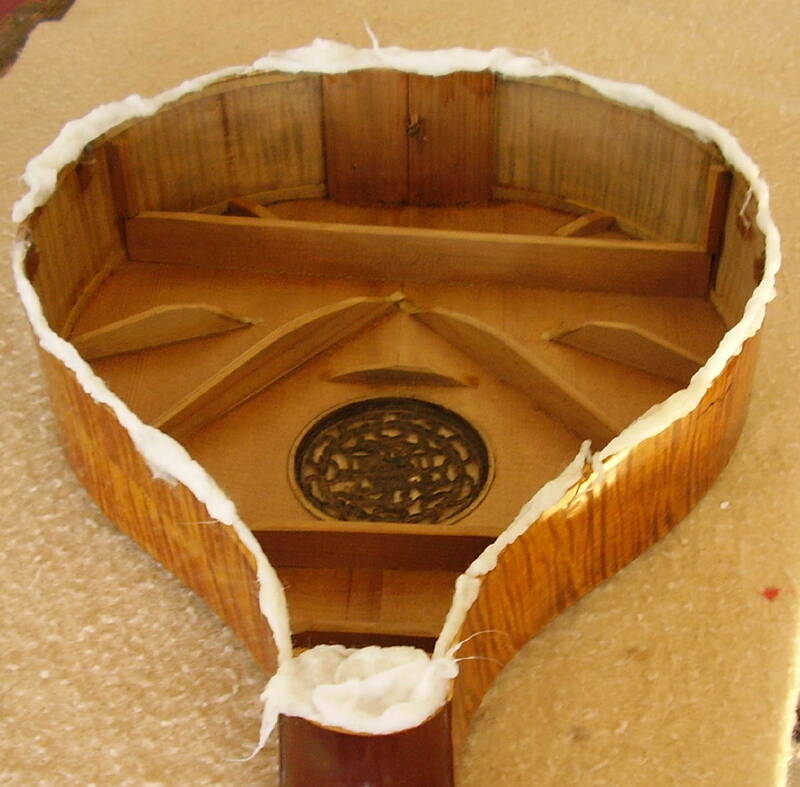 The missing veneer in the head was replaced with pieces saved by the owner. 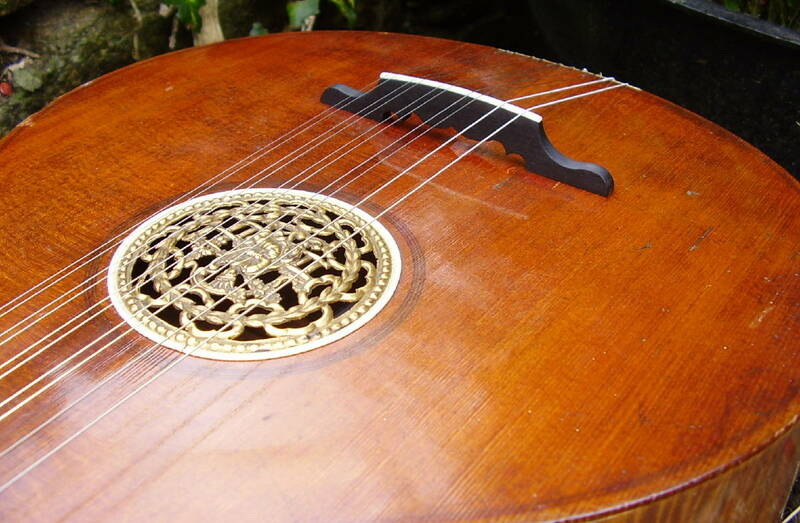 A new bridge replaced the old and modern steel strings were fitted, the diameters estimated from the strings on the instrument when it arrived. The resulting tension seemed about right and the guittar played and looked very well. 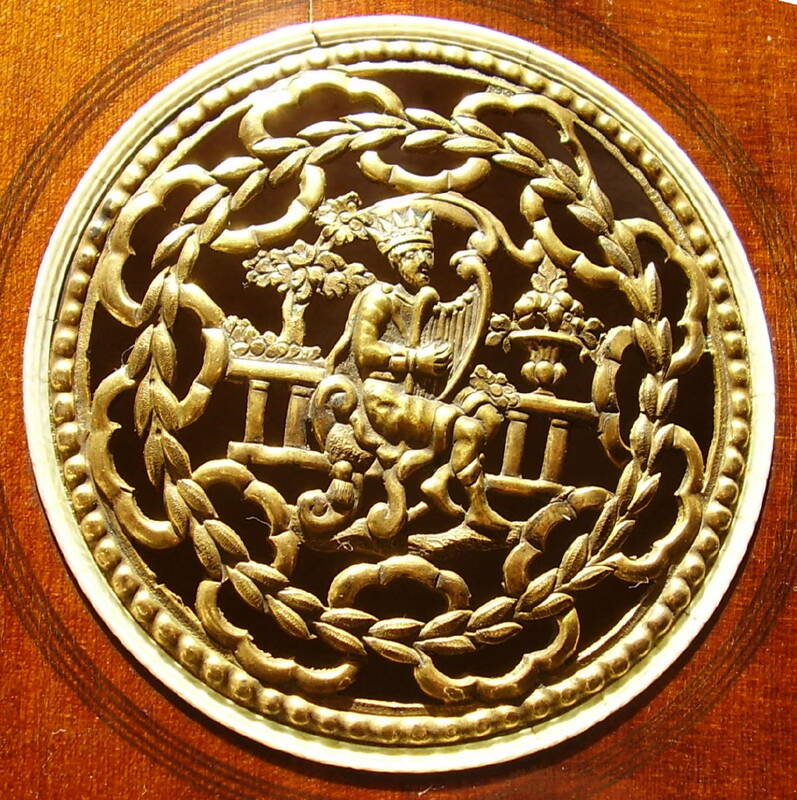 I am indebted to Jon Whitely, curator of the musical instrument collection at the Ashmolean, for allowing me examine the two Preston english guittars in their collection.